The server connection info window gives some information about the server. 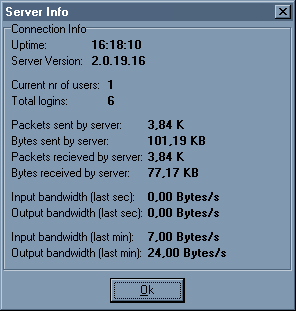 It shows the uptime of the TeamSpeak server, what version of the TeamSpeak server currently is running, the number of current users, the number of total logins to the server, the traffic the server handled in the time it was up and data on bandwidth. All the information shown here comes straight from the server.